Manufactured with natural and aged raw clay without other chemicals, fired at high temperatures, terracotta cladding is a architectural cladding material that provides certain degree of thermal insulation and weather resistance while creating an aesthetically pleasing facade. 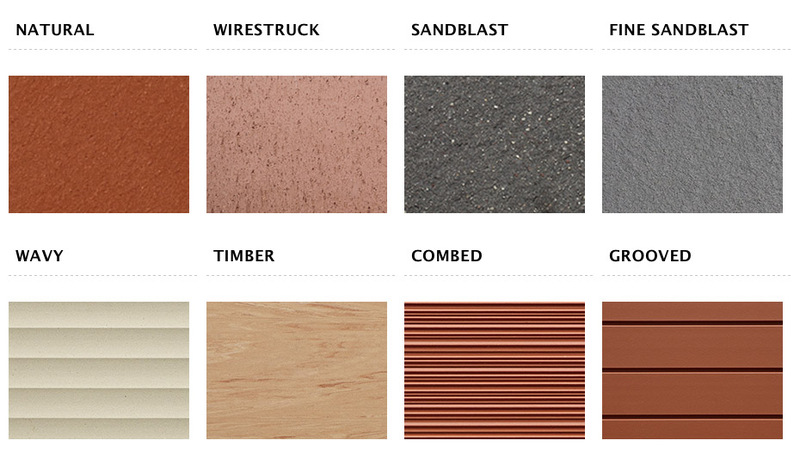 According to the installation approach and product form, terracotta cladding can be categorized into 3 types. Terracotta Rainscreen Cladding system is based on the principle of rain screen. 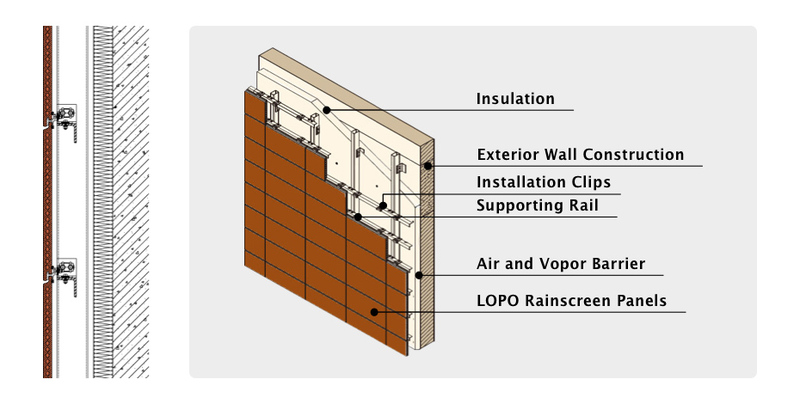 Comprised of terracotta panels, supporting track systems, ventilated cavity and vapor barriers, it's a back-ventilated curtain wall system. 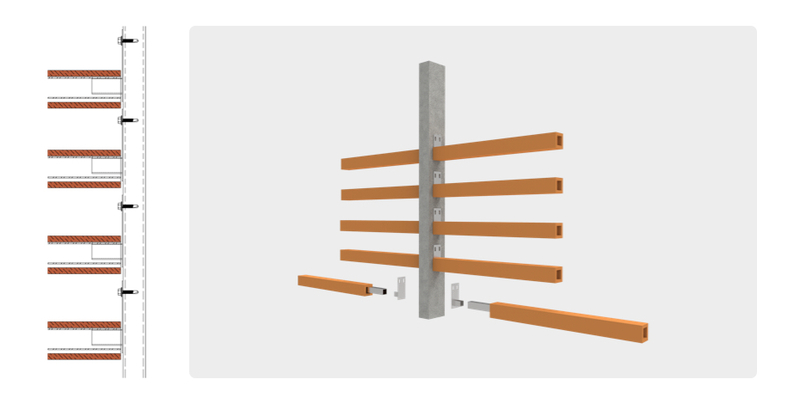 One of the highlight is the ship-lapped open joints, which makes it possible for the air to circulate between the cladding and insulation, thus, minimizing pressure differential inside and outside the wall cavities. Such system can shield most of the rain and snow from entering building envelopes. Meanwhile, a small amount of infiltrated water will be drained away through the system so as to protect the wall constructions of the building. In this solution, the terracotta siding is embed into large precast concrete panels. When it comes to the installation, solid terracotta panels with a thickness of 10-30 mm is often adopted. This type of solid tiles normally features a dovetail profile on the backside. Precast concrete panels is ideal for those projects that require terracotta facing design and also need the strength and durability of precast concrete constructions. Terracotta sunshade, also known as terracotta sunscreen, is a special terracotta wall cladding product. It can be used together with the terracotta rainscreen cladding to achieve a uniform and harmonious facade or as a separate design element to create a morden and distinctive building appearance. It is a unique terracotta cladding textures while providing shading for the building. There are variety cross-sections of terracotta screens that LOPO normally divided into terracotta louvers and terracotta baguettes. The terracotta cladding is a mixture of natural clay and water, which is extruded in vacuum and fired at a high temperature to a hardness and compactness that ordinary ceramic tiles cannot achieve. When the terracotta cladding is properly designed and installed, its life span is much longer than that of aluminum panels and fiber cement facades, and the color can last for a long time without fading. Terracotta ventilated cladding system provides better thermal performance than conventional masonry cavity wall systems. Due to the constant circulation of air between the terracotta cladding and the insulation, the condensate is continuously evaporated, reducing thermal transfer to the interior of the building, thereby reducing energy consumption. With a sandwich wall design, the precast terracotta cladding also enhances the thermal performance of the building. The use of terracotta louvers and baguettes can effectively reduce the direct exposure of the sun. To some extent, this can reduce energy consumption and provide the comfort for the interior space. 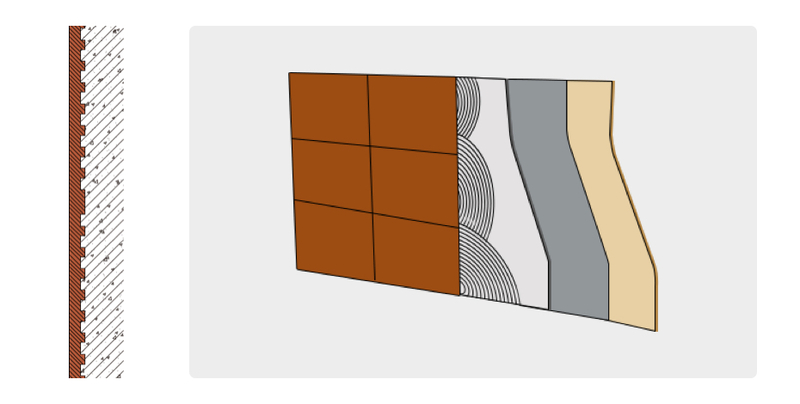 The surface of terracotta cladding is not likely to be dusty. It can be easily power washed every 2-3 years (or over even a longer period) and afterwards, it looks as if it were the original. The terracotta rainscreen cladding system does not use grout or sealants, therefore, reducing the need to maintain the joints. The terracotta cladding is fired at a high temperature, and being rated Class A fireproof – it does not burn, and proves to be a very safe cladding material. The terracotta cladding is made 100% of clay, which is environmentally friendly and harmless to humans and the environment. The terracotta cladding can also be recycled and reused as a new exterior wall material or as a building material. The surface of the terracotta cladding is mainly divided into two types: natural-fired and glazed. "When the clay material are put into the kiln, there is only one color; when they are taken out from the kiln, there are tens of thousands of colors." By blending different types of clay materials and precisely controlling the firing temperature in the kiln, it is possible to produce terracotta cladding with a rich variety of colors. Typically, the natural-fired colors include white, yellow, red, brown, and gray. For some special colors or tones, pigments and glazes can be added so as to produce the desired colors. Clay raw materials, pigments and oxides are reacted at high temperatures (typically between 1100 and 1300 degree centigrade) so that the color is durable and non-fading. In order to satisfy different requirements of the facade design, glazed terracotta came into being. After the terracotta loaf is dried and before it goes through the firing process, the glaze is applied to the natural surface terracotta panels whose color is similar to that of the glazed surface. 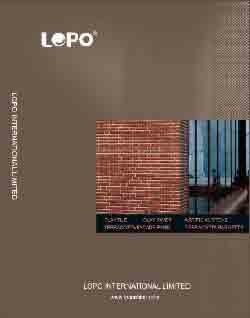 LOPO can achieve bright glaze, matte glaze, frosted glaze and 3D injected surface with different brightness and delicate glaze. Among them, digital inkjet printing panels can vividly present the texture and color of stone, timber and other personalized patterns and colors. The natural surface is the most classic surface of the terracotta cladding, which can fully bring out the texture of the architectural terracotta. In addition, according to the design requirements of the building facade, the terracotta cladding can be processed with a wide variety of surface texture treatment. The surface texture of the LOPO terracotta cladding includes natural surface, sandblasted surface, wirestruck surface, corrugated surface, grooved surface, linear surface, wood grain surface and etc. Different textures and finishes and different colors in the terracotta cladding products can come up with endless possibilities, so that the design of the building facade is free from any restriction. As the production process of modern terracotta products improves continuously, the terracotta cladding is no longer confined to flat shape. Based on the requirement of the project, it can provide a wide range of shapes and profiles. According to different facade structures, we can offer differently cross-sections and flexible geometric terracotta cladding products. 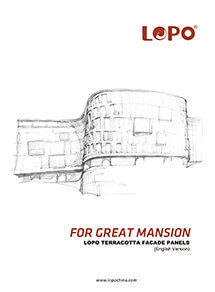 Please refer to LOPO terracotta panel product portfolio for details. Welcome to contact us for your further questions about how to clad your building in terracotta!